Whispers in the Loggia: On the "Pastor Angelicus"
On his part, Saint Peter in the pericope that was proposed to us, turning to the Christians of the communities of Asia Minor who “bear all sorts of trials”, goes beyond this: he asks them to feel, despite all this, “great joy” (1 Pet 1:6). Proof is in fact necessary, he observes, “so that the worth of your faith, more valuable than gold, which is perishable even if it has been tested by fire, may be proved -- to your praise and honour when Jesus Christ is revealed” (1 Pet 1:7). And then, for the second time, he exhorts them to be joyous, rather exult “with a joy so glorious that it cannot be described” (see 1:8). The profound reason of this spiritual joy is the love for Jesus and the certainty of His invisible presence. He makes the believers’ faith and hope unshakeable, even when faced with the most complicated and harsh events of existence. In the light of these Biblical texts we can read about the earthly life of Pope Pacelli and his lengthy service to the Church, which began in 1901 under Leo XIII and continued with Saint Pius X, Benedict XV and Pius XI. These Biblical texts help us, above all, to understand which was the source he drew from for his courage and patience in his pontifical ministry, during the troubled years of World War II and the following ones, no less complex, of reconstruction and difficult international relationship of history called “the Cold War”. “Miserere mei Deus, secundum magnam misericordiam tuam”: with this invocation from Psalm 50(51), Pius XII began his testament. And he continued: “These words,conscious of being unworthy and unequal, which I pronounced the moment I gave, trembling, my acceptance of the election as Supreme Pontiff, with greater conviction I repeat now”. This was two years before his death. To abandon oneself in the hands of the merciful God: this was the attitude my veneerable Predecessor constantly cultivated, the last of the Popes born in Rome and belonging to a family tied to the Holy See for many years. In Germany, where he was the Apostolic Nuncio, first in Munich of Bavaria and then in Berlin until 1929, he left behind grateful memories, especially for having collaborated with Benedict XV in the attempt to stop the “useless slaughter” of the Great War, and for having realized from the beginning the danger of the monstrous Nazi-Socialist ideology with its pernicious anti-Semitic and anti-Catholic root. He was created a Cardinal in December 1929, and shortly after became the Secretary of State. 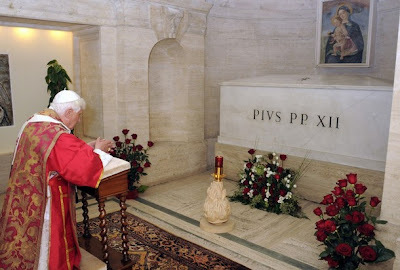 For nine years he was a faithful collaborator of Pius XI, in a time marked by totalitarianism: Fascist, Nazi and Soviet Communism, all condemned by the Encyclicals Non abbiamo bisogno, Mit Brennenbder Sorge and Divini Redemptoris. “Whoever listens to my words, and believes in the one who sent me, has eternal life” (Jn 5:24). This assurance made by Jesus, which we have heard in the Gospel, makes us think back to the hardest moments of the Pontificate of Pius XII when, realizing the loss of any human security, he felt the need, even through constant ascetic effort, to belong to Christ, the only certainty that never sets. The Word of God thus becomes the light of his path, a path in which Pope Pacelli had to comfort the homeless and persecuted persons, dry the tears of suffering and the crying of so many victims of the war. Only Christ is the true hope of man; only entrusting the human heart to Him can it open up to love that overcomes hate. This knowledge followed Pius XII in his ministry as the Successor of Peter, a ministry that began when the menacing clouds of a new world conflict grew over Europe and the rest of the world, which he tried to avoid in all ways: He called out in his message on the radio on August 24 1939: The danger is imminent, but there is still time. Nothing is lost with peace. Everything can be lost with war”. (AAS, XXXI, 1939, p. 334). Unfortunately, the historical debate on the figure of the Servant of God Pius XII, which has not always been the calmest, has prevented us shining a light on all the aspects of his multifaceted Pontificate. There was a great multitude of speeches, addresses and messages delivered to scientists, doctors, and representatives of the most varied categories of workers, some of which even today still possess an extraordinary relevance and continue to be a concrete point of reference. Paul VI, who was his faithful collaborator for many years, described him as an erudite man, an attentive scholar, open to modern means of research and culture, with an ever-strong and coherent fidelity both to the principles of human reasoning, as well as to the intangible depository of the truth of faith. He considered him a precursor of Vatican Council II (cf Angelus of 10 March 1974). From this point of view, many of his writings deserve to be remembered, but I will limit myself to quoting from only a few. With the Encyclical Mystici Corporis, published on 29 June 1943, while war still raged, he described the spiritual and visible relationships that unite men to the Word Incarnate, and he proposed integrating into this point of view all the principle themes of ecclesiology, offering for the first time a dogmatic and theological synthesis that would provide the basis for the Conciliar Dogmatic Constitution Lumen Gentium. A few months later, on 20 September 1943, with the Encyclical Divino afflante Spiritu he laid down the doctrinal norms for the study of Sacred Scripture, highlighting its importance and role in Christian life. This is a document that bears witness to a great opening to scientific research on the Biblical texts. How can we not remember this Encyclical, during the course of the work of this Synod that has as its own theme “The Word of God in the Life and the Mission of the Church”? It is to the prophetic intuition of Pius XII that we owe the launch of a serious study of the characteristics of ancient historiography, in order to better understand the nature of the sacred books, without weakening or negating their historical value. The deeper study of the “literary genres”, whose intention is to better understand what the sacred author meant, was viewed with a certain suspicion prior to 1943, in part thanks to the abuse that had been made of it. The Encyclical recognized that it could be applied correctly, declaring its use legitimate not only for the study of the Old Testament, but also the New. “In the present day indeed this art - explained the Pope - which is called textual criticism and which is used with great and praiseworthy results in the editions of profane writings, is also quite rightly employed in the case of the Sacred Books, because of that very reverence which is due to the Divine Oracles”. And he added: “For its very purpose is to insure that the sacred text be restored, as perfectly as possible, be purified from the corruptions due to the carelessness of the copyists and be freed, as far as may be done, from glosses and omissions, from the interchange and repetition of words and from all other kinds of mistakes, which are wont to make their way gradually into writings handed down through many centuries” (AAS, XXXV, 1943, p 336). The third Encyclical I would like to mention is Mediator Dei, dedicated to the liturgy, published 20 November 1947. With this document, the Servant of God provided an impulse to the liturgical movement, insisting that “the chief element of divine worship must be interior. For - he writes - we must always live in Christ and give ourselves to Him completely, so that in Him, with Him and through Him the heavenly Father may be duly glorified. The sacred liturgy requires, however, that both of these elements be intimately linked with each another... Otherwise religion clearly amounts to mere formalism, without meaning and without content”. We cannot do other then than acknowledge the notable impulse this Pontiff gave to the Church’s missionary activity with the Encyclicals Evangelii praecones (1951) and Fidei donum (1957), that highlighted the duty of every community to announce the Gospel to the peoples, as Vatican II would go on to do with courageous strength. Pope Pacelli had already shown this love for the missions from the outset of his Pontificate when in October 1939 he had wanted to consecrate personally twelve bishops from mission countries, including an Indian, a Chinese and a Japanese, the first African bishop and the first bishop of Madagascar. One of his constant pastoral concerns, finally, was the promotion of the role of lay people so that the ecclesial community could make use of all its possible energy and resources. For this too the Church and the world are grateful to him. Dear brothers and sisters, while we pray that the cause of beatification of the Servant of God Pius XII may continue smoothly, it is good to remember that sanctity was his ideal, an ideal he never failed to propose to everyone. This is why he promoted the causes of beatification and canonization for persons from different peoples, representatives of all states of life, roles and professions, and granted substantial space to women. And it was Mary, the Woman of salvation, whom he offered to humanity as a sign of certain hope, proclaiming the dogma of the Assumption, during the Holy Year of 1950. In this world of ours, which, like then, is assailed by worries and anguish about its future; in this world where, perhaps more than then, the distancing of many from truth and virtue allows us to glimpse scenarios without hope, Pius XII invites us to look to Mary assumed into the glory of Heaven. He invites us to invoke her faithfully, so that she will allow us to appreciate ever more the value of life on earth and help us to look to the true aim that is the destiny of all of us: that eternal life that, as Jesus assures us, already belongs to those who hear and follow his word. Amen!